NO RESERVE - Aged Ultra Premium Domain - Enormous Brand Potential - A Must See! NO RESERVE - This gem will sell to the highest bidder! NO RESERVE - 60 premium domains - 70% are over 11 years old & 10 months renewal! NO RESERVE - Monster 1-Word LLL - 673,000 exact searches/mo - Huge Opportunity! NO RESERVE - This gem will sell to the highest bidder! + @dnexperts Twitter! No Reserve - Portfolio of 50 Premium One Word .INFO Domains - You Must See This! 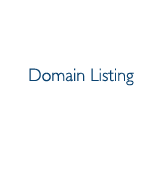 No Reserve - Valuable Portfolio of 55 Premium .COM NET ORG Domains - Must See!